Leaving stakes to mark lily locations will offer easy tie-ups in spring. As another year draws to a close, I’m embarking on a newbie gardening adventure and invite you to join the fun via a virtual Amaryllis Advent Calendar – with chances to get some free gardening goodies; details later in this post, so keep reading! I’m always telling our gardening clients that part of being a teacher is being a student; to me, gardening is a lifelong pursuit of knowledge. No gardener will ever know it all, but by taking classes, asking for help and trying new things, we all continue to learn to grow. This year, when I was ordering spring bulbs for clients to plant in fall, I was smitten by our supplier’s selection of Amaryllis, which I had never tried to grow. So I ordered a few to try. Before potting up my bulbs, I sought out advice from several amazing veteran Amaryllis-growing gals — including Christina Salwitz of Fine Foliage, Kylee Baumle of OurLittleAcre.com and Dee Nash of Reddirtramblings. Right off the bat, Dee corrected me on a common misconception; when we try to get Amaryllis to bloom indoors in winter, we aren’t actually forcing them the way we do spring-flowering paperwhites. Rather, Amaryllis are tropical in nature and already want to bloom this time of year. Okay, first lesson learned! 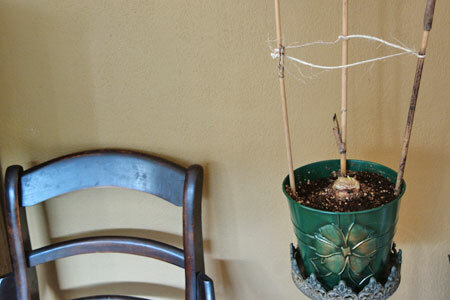 – Avoiding Flops: Christina and Dee suggest inserting supportive stakes when you pot up the bulbs or you may (as Christina put it) “hear an Amaryllis avalanche, usually at 3am” when they fall over. If you put the stakes in at potting time instead, Christina finds the roots grow around the stakes, giving them extra stability. Kylee, on the other hand, tries to remember to get her stakes into the pots when the flower stalk is about half way to its mature height. – Christmas Day Blooms: Self-proclaimed Amaryllis Whore Kylee counseled me not to count on getting my Amaryllis to bloom by a specific date. She reminded me that you can aim for flowers by Christmas, but different light exposure, room temperature, fertilization, variety of bulb and more may impact how long it takes to get those gorgeous flowers to pop open. Yep, Dee backed her up on this bit of news. Three potted ‘Merry Christmas’ Amaryllis sharing space in a south-facing window. Since I’m a newbie, I stuck with one variety to grow for my first foray: ‘Merry Christmas’. It is reported to take about 4 weeks from planting ’til blooming deep red on short stems, which may not require staking. Sounds like a recipe for newbie success — and really pretty too! How I’m growing mine: Just a few days ago, I sought out inexpensive holiday containers at my local thrift store, and had luck finding a couple of painted metal poinsettia pots in red and green. After drilling a few holes in each pot, I filled them with soil that I watered thoroughly with Moo Poo Tea (on the advice of my counselors) before planting. 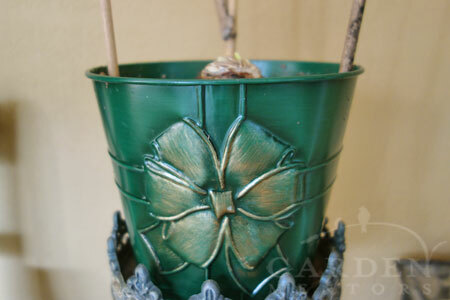 A recycled Poinsettia holiday tin for $.99 at a thrift store makes a great Amaryllis container for the holiday season. After I allowed the soil to drain well, I settled in a bulb, covered it to its shoulders in more soil, and watered the whole thing in with more Moo Poo Tea. 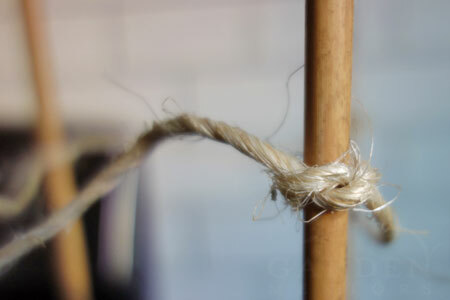 Then, I cut several bamboo stakes harvested from my garden to insert into each pot, adding a length of jute wrapped around the upper ends of each stake, to hold them together gently as the leaves and flower stalks rise up from the soil. Each pot is sitting in a south facing picture window near a furnace vent, so I’m hopeful they’ll bust a move fast. I’ve given my bulbs about six weeks to bloom if they want to cheer me by Christmas day. If not, that’s okay; the winter doldrums will continue to plod along long after Santa visits. **Now closed & winner has been notified by email**: How you can enter for a chance to win* a ‘Red Lion’ Amaryllis bulb and Moo Poo Tea: RedDirtRamblings, OurLittleAcre and GardenMentors will each be giving away a ‘Red Lion’ Amaryllis bulb^ and 3-pack of Moo Poo Tea to one lucky new subscriber to each of our lists. Each person may enter for a chance to win via each website. **Now closed & winner has been notified by email**: Entering on this site is a 2-step process and is only open from 11/21/2014-11/30/2014 at midnight. You must in in the Continental United States to enter. Number of entries will determine odds of winning. Winner must provide name and shipping information within 3 days of being notified or will forfeit. Void where prohibited by law. More details via Rafflecopter ‘Terms & Conditions” below. You can still subscribe to the Garden Mentors list for free gardening information sent just often enough to your in-box! **Now closed & winner has been notified by email** Step two: Enter your name into the Rafflecopter giveaway form & be sure your information matches your subscription info or you will be disqualified. And, don’t forget to head on over to Red Dirt Ramblings and Our Little Acre to enter for a chance at their Amaryllis and MooPooTea offerings! Get more Holiday eye candy & other goodies: Garden Mentors will be posting photos and updates daily via Twitter until Christmas 2014, so you can watch our beauties grow. Just follow @gardenmentor on Twitter or check our Twitter feed on our homepage or the hashtag #AmaryllisAdvent. We might just give away more goodies to go with these updates during December 2014, so don’t forget to check the feed. Think of it like the Advent calendars kids open each day heading into Santa’s arrival; sometimes there’s a chocolate. Sometimes it’s just fun to do! *Regarding the items offered here: Be sure to review the terms listed on the Rafflecopter form. Items may have been purchased by us or donated as noted below to give out. Garden Mentors has received no compensation for this post or any of the items that will be given away. ^The winner’s Amaryllis bulb will be shipped directly from and through the generosity of Longfield Gardens ; the Moo Poo Tea was purchased and will be shipped by Garden Mentors. Read on for our Amaryllis Q&A with Kylee and Dee. 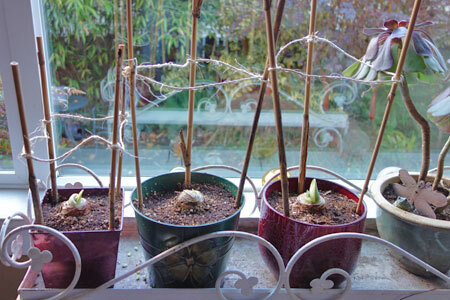 What or who inspired you to force your first Amaryllis? Kylee: Like all gardeners, I have a habit of poring over catalogs when they arrive, even if they’re not a company I typically order from. I don’t remember which catalog it was where I saw my first amaryllis about 10 years ago, but ‘Papilio’ really caught my eye. I loved the burgundy striping and it just looked different than the other ones. Of course it was a little more expensive than the other more commonly found ones, but I decided to go for it. Worth. Every. Penny. It was so beautiful and EASY. That got me started down the amaryllis rabbit hole and I’ve never had a winter without them since that first year. Dee: I grew my first amaryllis because I saw it done in a magazine. It was so long ago I don’t remember the magazine. What new Amaryllis variety (or other bulb) are you trying for the first time this year? 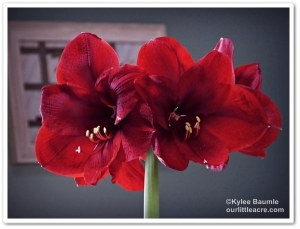 Kylee: I always try a new amaryllis (or two) each year and now that there are so many to choose from, it’s difficult for me to limit my order. My new one this year is ‘Lagoon’, which is a unique shade of deep pink. I’m not generally a pink flower lover, but I thought I’d try this one. What’s your favorite Amaryllis for newbies (or veterans growers)? Kylee: I adore ‘Papilio’, of course, but I’m also in love with the double ‘Blossom Peacock’. Those reddish-tinged edges on white get me every time. ‘Benfica’ and ‘Black Pearl’ are favorites too. Both of those are the deepest shade of dark red that almost seems impossible. The first year I grew ‘Black Pearl’ I kept stopping and staring at it and my husband said to me, “I’m glad that flower makes you so happy.” It’s just gorgeous. I’ve grown some of the cybister types, which have a different look with much thinner petals, almost spidery. That was fun for a couple of years, but I tend to gravitate towards the larger, fuller blooms. As with most flowers, people have a preference as to color, size and style, so if you see one that appeals to you, go for it. It doesn’t matter if it’s common or unusual, they’re all easy to grow and if you’re like me, you’ll want to try them all eventually anyway. Dee: I say go big or go home. (Try) ‘Picotee’ It’s white with a red edge. For veteran amaryllis grower, try a cybister type. They are all spidery and beautiful. Be sure to visit Dee and Kylee on their blogs for more great gardening thoughts, ideas and information. Plus, sign up for their mailing lists to get even more fantastic information sent directly to your in-box…maybe an Amaryllis start and Moo Poo Tea will come your way as well! Fun Robin. I checked out the new blogs, always fun to have more info. Happy Thanksgiving! I am not on twitter, will you be posting your updates here or on FB ? Some updates may hit FB, but maybe not quite as frequently. You can watch the pix via Twitter on our website homepage in the lower right. 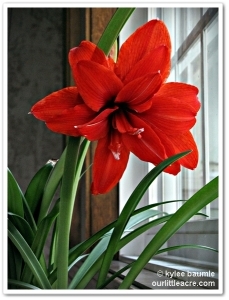 Too, you can join the Amaryllis Advent Pinterest board here: http://www.pinterest.com/deeanash/garden-amaryllis-advent/. Thanks! Linda, thanks so much for sharing! Hope you entered at all the sites for multiple chances to get the goodies! I am already a subscriber and trying to figure out how to enter. I will also subscribe to the other blogs. Thanks! Cathi, be sure to enter your info in the rafflecopter entry form (if you haven’t already).